Walter and Doris Green came to Pagosa Springs, Colo. in 1997 to retire. The baby boomers built a home and settled into small town life. She became president of the Pagosa Springs Arts Council. He served as president of Friends of the Performing Arts and recently dabbled in politics, running for County Commissioner. But last year, they decided to go back to work. 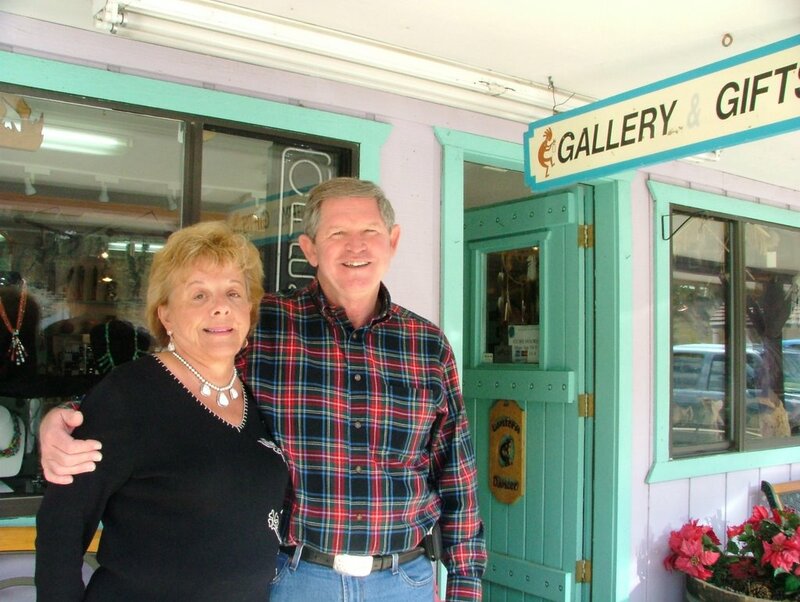 The Greens purchased Lantern Dancer gallery from founders Jerry and Rose Zepnick. The Zepnicks started the jewelry store and gallery with artist Sue Weaver in 1992 and continued to operate the business successfully after Weaver died of cancer in 1999. When asked why they would leave retirement behind to become small business owners, Walter said that they couldn’t pass up the opportunity to assume a successful business. Doris Green, former chairwoman of Adware Systems, was at one time the highest-ranking woman in the largest advertising agency in the world—McCann-Erickson. The most notable changes in the business since the Green’s purchased Lantern Dancer are in the slick brochures and high-fashion ads that they are running to promote their gallery and jewelry store. They have also created a preferred customer list and have associated with Fairfield Resorts, which is now the number one generator of customers for their business. Additionally, they are gradually upgrading the interior of the store; hiring local artisans to build new display cabinets. “As much as possible, we use local vendors to create our ads and do some of our printing,” Walter said. They are a small business supporting other local small businesses. Including local artists. They sell the work of five local jewelry artists, painters and wood sculptors: Nancy Green, Syl Lobado, Darlene Rae, Claire Goldrick and Richard Sutherland. They also carry the last remaining work of Sue Weaver. And they have added more work by Native American artists, including Alfred Lee, Jr. and Alfred Lee, Sr. both from the Navajo Nation outside of Shiprock, Ariz. and Ute Mountain tribe member Norman Lansing who lives in Arboles, Colo.
Alfred Lee, Sr. is a silversmith who creates high quality silver bracelets, pendants, earrings and rings with the highest quality natural turquoise from his extensive private collection. Alfred Lee, Jr. is a bead artist whose work was recently featured on the model in all the print and television media for Ralph Lauren’s perfume Turquoise. Both Lee’s can pinpoint with amazing accuracy not only the mine the turquoise came from, but also the time frame of its extraction. Lansing is one of the finest sgraffito artists working today and his intricately incised pottery tells traditional stories of his tribe, echoing the ancient petroglyphs found all over the Four Corners. A visit to Lantern Dancer will likely involve meeting either Walter or Doris, as they are hands-on owner operators. Perhaps you will hear the story of how they came to Southwest Colo. to ride the train in Durango because Walter is a former trainman and conductor with the CSX railroad and how they drove through Pagosa Springs fell in love and bought property. Lantern Dancer is located in the River Center on the East side of Pagosa Springs. Contact Walter and Doris Green there at 970-264-6446.